Thomas Annan (1829–1887) was a Scottish photographer, notable for being the first to record the bad housing conditions of the poor. Born in Dairsie, Fife he was one of seven children of John Annan, a flax spinner. After his initial apprenticeship as a lithographic writer and engraver at the Fife Herald in Cupar, he moved to Glasgow in 1849 and worked as a lithographer and engraver for Joseph Swan until 1855. He set up business with George Berwick at 40 Woodlands Road, Glasgow, listing in the 1855 - 56 Glasgow post office directory as calotypists, practitioners of this early form of photography. In 1855, he photographed the ship RMS Persia, under construction on the Clyde, which was probably a commission by engineer, Robert Napier. This photograph was part of a group of images sent to the Photographic Exhibition in connection with the British Association. After dissolving his previous partnership, he established himself in a photographic studio at 116 Sauchiehall Street during 1857. In 1859, the business moved to 200 Hope Street  and he was also able to establish a printing works in Hamilton in 1863. 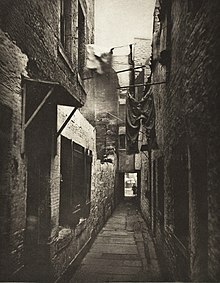 First interested largely in architectural photography and then portraits, as well as photographing artworks and maps, in 1866 Annan photographed slum areas of the city. These images were used by Glasgow City Improvement Trust to document the overcrowded, unhygienic conditions ahead of extensive redevelopments. It was this series of photographs, created between 1868 and 1871, entitled Old Closes and Streets of Glasgow, that ensured his prosperity. In 1869, Annan purchased the contents of Rock House, which belonged David Octavius Hill, which included many of Hill's photographs and negatives. These were eventually exhibited by Thomas' son, James Craig Annan, and reproduced in photogravure in Alfred Stieglitz's journal Camera Work. After his death in 1887, the firm continued to produce volumes of photography, including the third photogravure edition of Old Closes and Streets, in 1900. Annan's photographs of the Loch Katrine Waterworks were praised in the British Journal of Photography: "The views by Mr. Annan could scarcely fail to be attractive, for in a country so beautiful a clever artist is bound to produce results in keeping with the nature of the subject, and this Mr. Annan has done." Indeed, Annan's work was often praised not only for its aesthetics, but also for its technical virtuosity. Twenty years later, Annan's studio would be singled out by Baden Pritchard for its accomplishments in carbon printing and "beautiful pictures of exteriors and interiors of Scotch strongholds." Thomas Annan purchased the rights to the photogravure process in Britain from Karel Klíč of Vienna in 1883 after visiting the city with his second son, James Craig Annan. James was a noted photogravurist and associated with late nineteenth-century art photography continued in his father's profession, receiving a Royal Warrant as 'Photographers and Photographic Engravers to Her Majesty in Glasgow'. The family business survives to the present day in the form of the Annan Fine Art Gallery, located on Woodlands Road in the West End of Glasgow. A selection of prints from the Glasgow Improvements act 1868 series were displayed in the Scottish National Portrait Gallery from 2011 to 2012. In 2017, the Getty Museum curated an exhibition entitled Thomas Annan: Photographer of Glasgow, the first to survey his career and legacy as photographer and printer. ^ Stevenson, Sara (1990). Thomas Annan, 1829-1887. Edinburgh: National Galleries of Scotland. p. 4. ^ "The Post-Office annual Glasgow directory 1855 - 56, page 522". www.archive.org. Retrieved 27 April 2016. ^ "The Post-Office annual Glasgow directory, 1957 - 58 page 57". www.archive.org. Retrieved 27 April 2016. ^ "The Post-Office annual Glasgow directory 1859 - 60, page 59". www.archive.org. Retrieved 27 April 2016. ^ "Thomas Annan Collection - libcat.csglasgow.org". libcat.csglasgow.org. Retrieved 27 April 2016. ^ Hannavy, John (2008). Encyclopedia of Nineteenth-Century Photography. Routledge. p. 660. ISBN 9780415972352. ^ "Glasgow Photographic Exhibition". British Journal of Photography: 441. 15 September 1876. ^ Pritchard, Baden H. (1882). The Photographic Studios of Europe. London: Piper & Carter. p. 200. ^ Stevenson, Sara (1990). Thomas Annan, 1829-1887. Edinburgh: National Galleries of Scotland. pp. 7–8. ^ "Close Encounters: Thomas Annan's Glasgow". nationalgalleries.org. National Galleries Scotland. ^ "Thomas Annan: Photographer of Glasgow". Retrieved 23 April 2018.